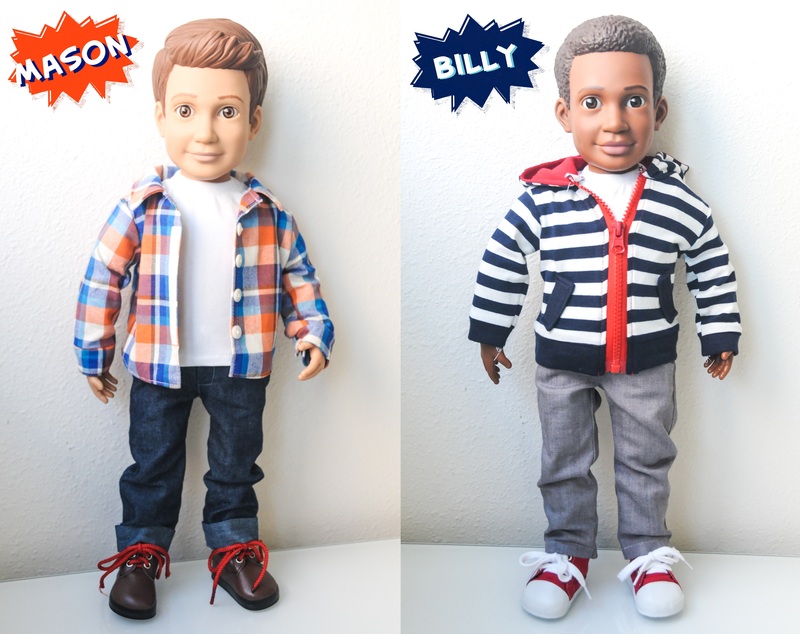 We are excited about Boy Story, Action dolls that are hitting the toy market! We know you will love them as much as we do! 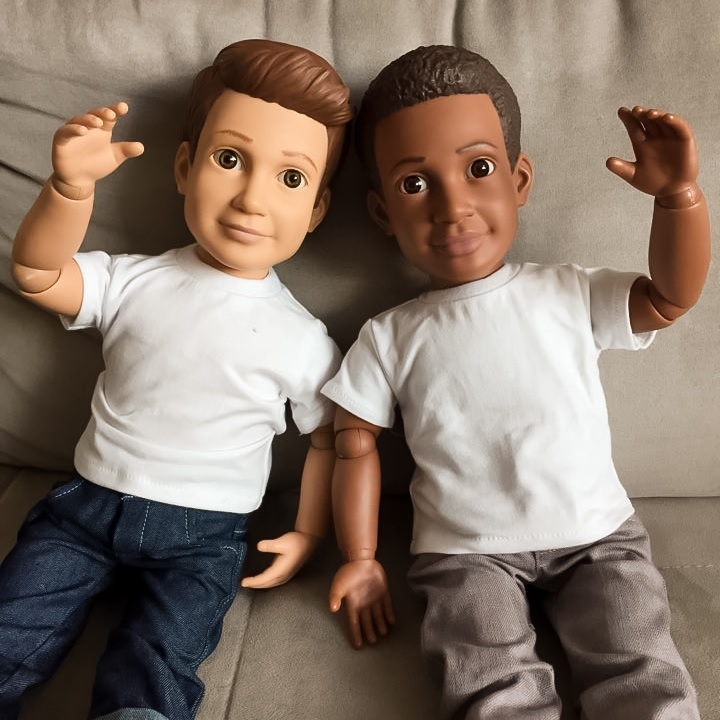 Boy Story introduces Action Dolls to the toy market. Action Dolls are 18″ jointed dolls designed for lots of rough and tough play along with a healthy dose of love. Each comes with an adventure story that gets the imagination whirring while teaching life’s little lessons. Billy and Mason (our first two dolls) are kid companions. They are cool. They can ride along in a backpack or bicycle. They are just plain fun! Boy Story dolls are easily cleaned should the get dirty (which we plan on!). They have molded hair, which makes them easier to clean and much more durable as standard doll hair (either wigged or rooted) does not typically hold up well if washed often. Most importantly, boy story dolls aren’t just dolls, they’re ACTION DOLLS! 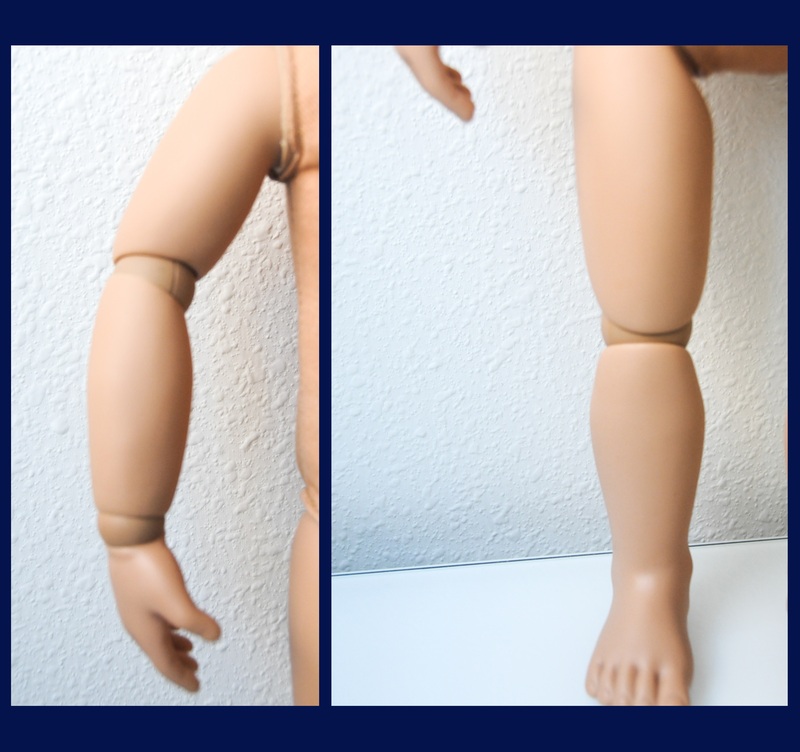 These are not the standard strung dolls (strung doll joints do not hold poses well, but are much less expensive to manufacture) with 5 points of articulation you will see in most other dolls, our dolls have 11 points of articulation with 6 of these joints being separate ball joints. These joints were designed specially for our doll to ensure that they could hold poses just as well as your favorite action figures. Just pose him around next to other 18” standard dolls and see who can do the cooler poses! And to top it all off, even though we wanted the dolls to be cool like an action figure, we wanted to make sure that they were also lovable. We accomplished that by giving the action doll a soft plush body perfect for squeezing and cuddling. Lastly, we made sure to use only the safest and highest quality materials in the making of our action dolls. They have been tested thoroughly and pass US, EU and Canadian safety tests with flying colors. 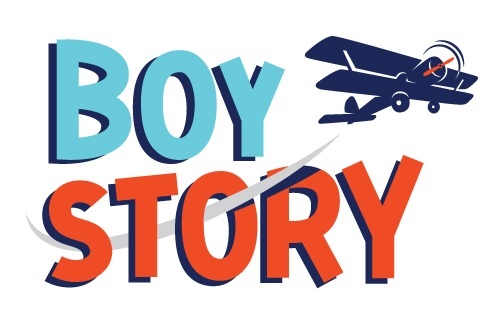 Boy Story is the result of lots of playing, big dreaming, and a bit of frustration. We are sisters, and joined forces to start the company earlier this year. Katie is the creative genius behind everything, with design background and a passion for all things beautiful and fun. She quit her job last spring and is dedicated full time to making Boy Story the absolute best. Kristen is the mom of two young boys and knows what it means to have a few quality special toys rather than boxes full of unused toys. Together we want to bring the world diverse toys, built to last and blast through modern-day stereotypes. 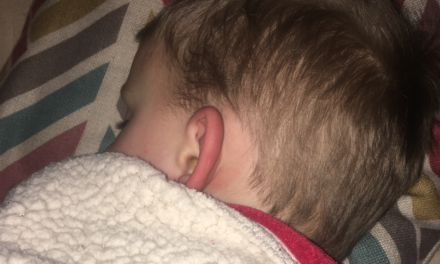 While pregnant with her second son, Kristen set off shopping to buy a special playmate for her older son–to help introduce the new baby and all that. She wanted a doll that was same-age, cool, and could withstand some serious play. Weeks on the hunt for an ideal toy, nothing turned up. There were baby dolls. There were cheap, plastic dolls. There were lots and lots of girly cute dolls. There were plush dolls. But try to find a cool, boyish doll for your son. We dare you! We tried and kept turning up empty handed. Nothing hit the mark. And we were not alone. 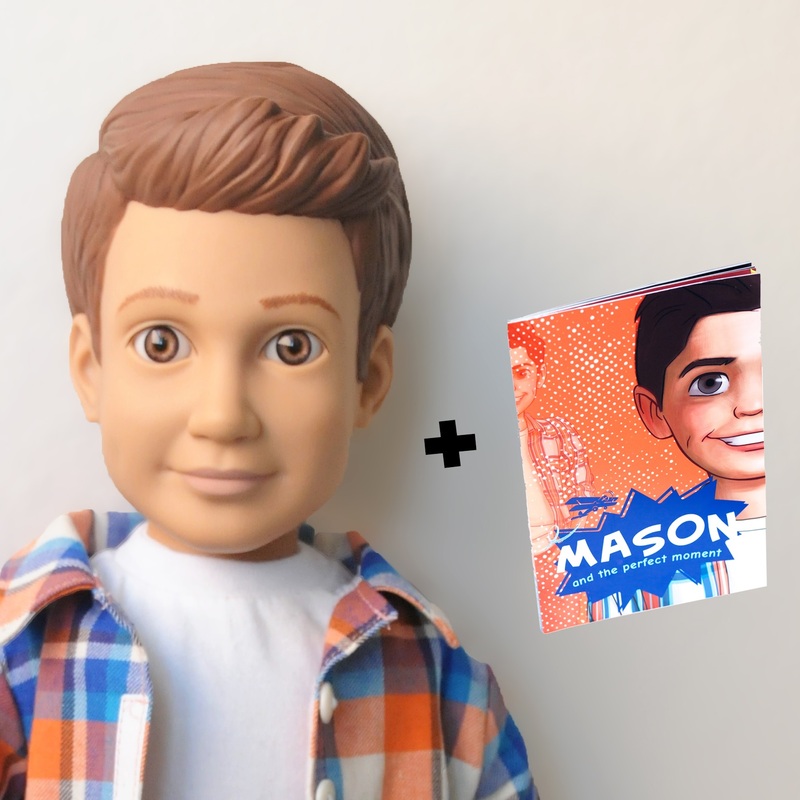 Moms, kids, friends, and families everywhere are clamoring for a boy doll. The mega-toy industry seems glued to its position that dolls must be super feminine and appeal to one market only. Enough already! So after brainstorming, lots and lots of napkin doodles, and market research, we dreamed up our Action Dolls. 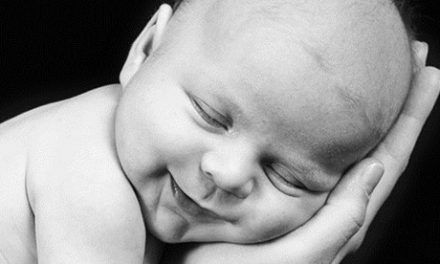 Boy Story was born! 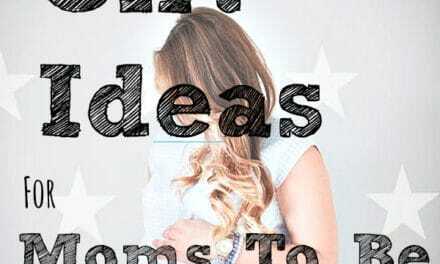 How does your business help families? Pretend play is an essential part of childhood. Kids go exploring in their backyards, lay in the grass and stare at shapes in the clouds, skip down sidewalks. Maybe a wooden plane will thrill all afternoon as it flies through adventures. Perhaps a pillow fort. A few friends, some fresh lemonade, and big minds are all it takes to turn a lazy afternoon into a great day. Our focus is to create a toy that lets the imagination run wild. Action Dolls are designed to join in the fun. They foster companionship, communication, and empathy. These are traits for every child, and they learn them best through play. Families who play together stay together! We at Boy Story aim to change harmful stereotypes that have become the norm in the toy isles. Pink is for girls, blue is for boys, dolls and kitchen sets are for girls, cars and building toys are for boys… WHO SAYS?!? Toys have increasingly become more and more gendered in the last decade because of big name toy companies gendered marketing. 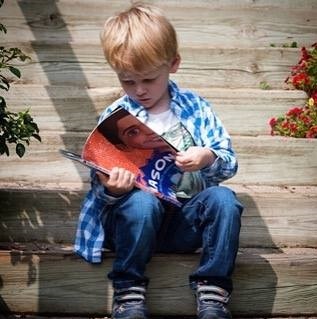 Boy Story believes that every child deserves to walk down an isle of toys and chose what interest them WITHOUT guidelines. Girls should be able to learn building and engineering skills without having to buy a “boy’s toy” and boys should be able to pretend they are a chef, or let their imaginations run wild with a companion doll that’s just like them without feeling ashamed they are playing with a “girl’s toy”. 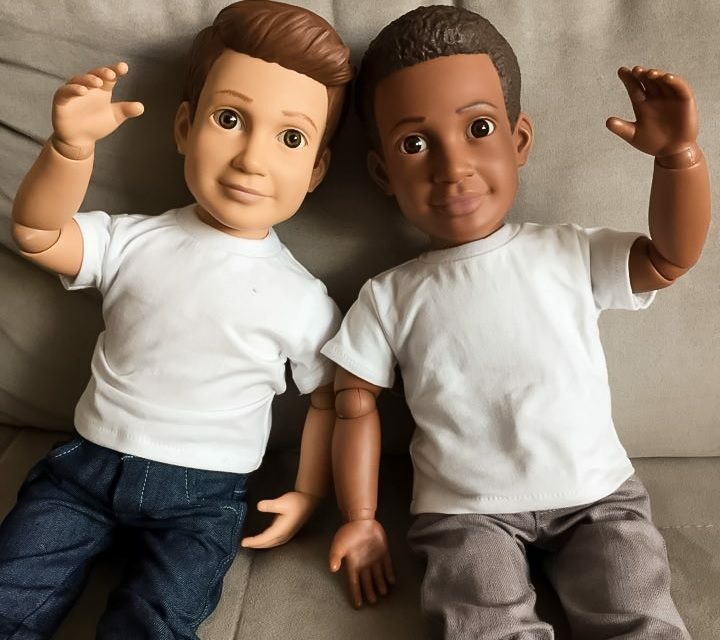 Boy Story aims to play it’s part and change the opinion that dolls are only for girls. Most importantly, we need your readers’ help! We are launching a Kickstarter campaign in April to bring these Action Dolls to life. 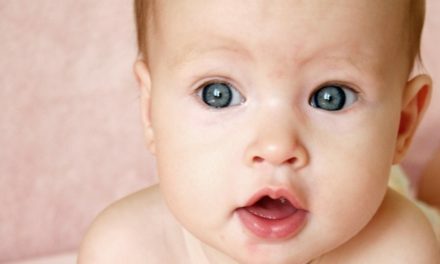 Please follow us one one of our social media outlets and sign up for our newsletter here: http://eepurl.com/bEX4Z5. We will keep you updated with the latest on our Kickstarter launch.